Yesterday, the 29th of October, was the annual Cycle With Champions, which is the Team Swift primary fundraising event. If you haven’t heard of Team Swift, they are an excellent organization, committed to the development of junior cyclists. They have one of the best cycling programs for juniors in the country and coach Laura Charameda has worked hard to routinely produce great cyclists and well rounded young adults. There are so many reasons why cycling is a beautiful sport and rides likes this are but one. With most sports, fans don’t get the opportunity to participate with stars and celebrities. Imagine paying a few dollars and getting to play baseball with Buster Posey and Brendan Crawford. It just doesn’t happen. Thankfully cycling is different. And, events like Cycle With Champions allow cyclists of nearly any ability the opportunity to meet, greet and ride with cycling greats. While the attendees vary from year to year, a list of past and current celebrity visitors reads like a who’s who of American cycling greats and legends. “Fast Freddy” Rodriguez, Chris Horner, Lucas Euser, Steven Cozza, Gavin Chilcott, Scott Nydam, Ryan Eastman and more. Cycle With Champions is a well thought out and well run event. One can preregister for either a long or short route. Additional registration is generally available the morning of the event. This year, one could choose between a 30 or 50 mile option. The start and finish was at the very well maintained Sonoma Day School. Cyclists and attendees signed in for the event in a lovely courtyard. Ample food and hydration options were laid out on well organized tables. And cyclists were able to attend to their “business” in clean, well stocked lavs. This was a far cry from a row of porta-pottys in the middle of nowhere. 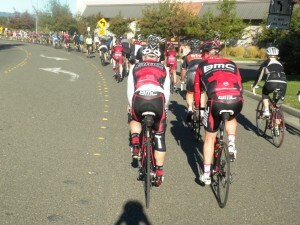 The BMC Service Course truck and two of their team cars were on hand, lending an air of authenticity to the morning. Several other team cars were visible in the parking lot, including the Team Swift van. 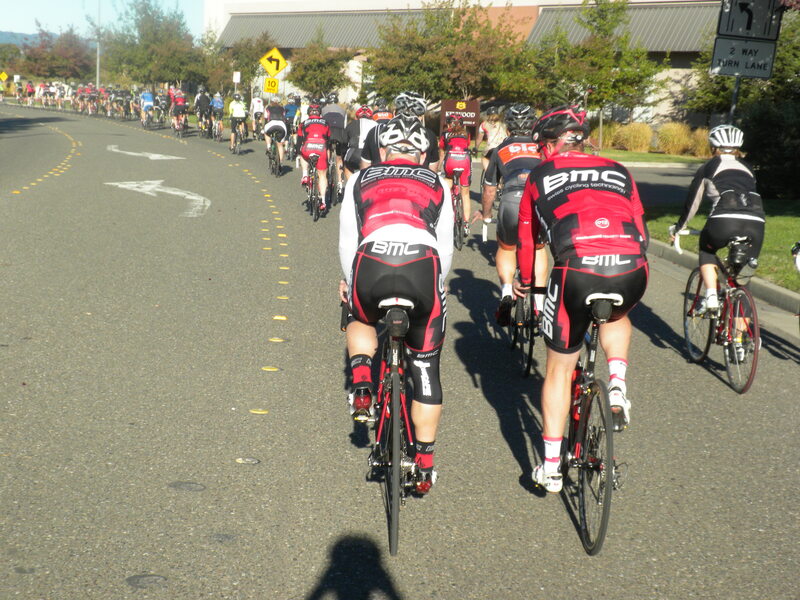 Between the charming wine country grounds of the school, the gorgeous Sonoma County scenery in the background and all the team cars, it felt like a fun mix between a European fondo and century ride. The ride itself started at roughly 9:30. On his three-wheeled motorcycle, Richard Stone lead the way, keeping the pace controlled and the group together. I found myself mid-pack, content to sit in the group behind the predictably smooth wheel of Gavin Chilcott, the GM of BMC Racing. Over the first 8.5 miles, the pace was conversational and it remained gruppo compatto. Hard to imagine that with so much potential power up front, the pace was incredibly tame. 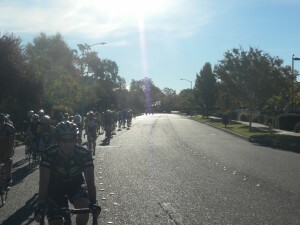 The purpose of the ride, of course, is to encourage people to come out and, as the name suggests, cycle with champions. And these opening miles provided that opportunity. Nearly everyone rode comfortably together until the first stop, a photo-op on Wohler Bridge. After the paparazzi got their fill of photos, we all clipped back into our pedals. At this point, the group was ready to separate. When the faster riders attacked the small rolling hills on Westside Road, the once large group had become a series of smaller cooperative collectives. It would be hard to imagine a more picturesque locale than Sonoma County. And on a day like yesterday, the views of vineyards and mountains that one sees from Westside Road are spectacular. Riders were then treated to a nice snack at the Seghesio Winery in Healdsburg. To wrap it up, the Team Swift Cycle With Champions is a great ride for a great cause. Every year the turn out is great, the riders have fun, the weather is almost always stellar and it is just a great day on a bike. Whether you are a Sonoma County local or just looking for an excuse to visit, consider doing this ride. You don’t have to keep up with the pros, just show up, have fun and feel great knowing that you are supporting America’s best youth cycling program. Hope to see you next year.